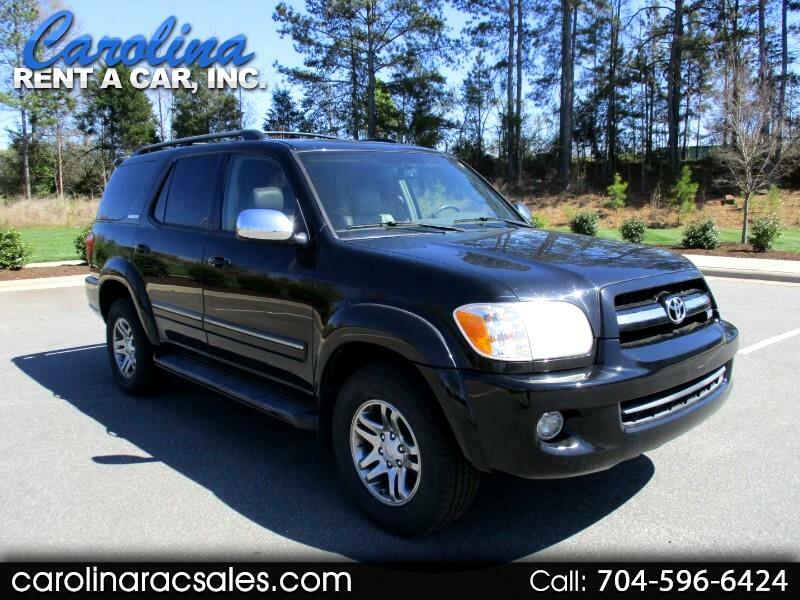 Used 2007 Toyota Sequoia Limited 4WD for Sale in Charlotte NC 28213 Carolina Rent A Car, Inc. Very nice low mileage Limited Sequoia located in Charlotte, NC. Clean CARFAX all OEM panels! Just had Toyota of Concord do a new timing belt and water pump, oil change, 4 new tires and state inspection. Toyota inspected the frame and it did not require the frame recall. Power windows, power locks, moonroof, am/fm/cd player and cassette player, heated front seats, leather interior, seats 8, tow package, keyless entry, roof rack, rear audio system, and much more! This vehicle is ready for a new owner. Limited model has everything but rear DVD and Navigation, can add after market 10" DVD for $550.00 Call John at 704-596-6424 to schedule a time to see this vehicle. Carolina Rent A Car, Inc may post both vehicles that are on the ground ready for sale or vehicles that are currently held in our rental and lease fleet, therefore mileage may very slightly from that at posting. Should you need additional information or pictures you may visit us at carolinaracsales.com or call 704-578-3939. We have more vehicles available for purchase or rent on our lot - send us a message and we'd be happy to help your purchasing or rental needs. Carolina Rent A Car, Inc.